RPF Lady Constable Recruitment 2018 Apply Online in Railway Protection Force Openings for 9500 Railway Constable Jobs. For more details about RPF lady Constable Notification 2018 in Railway Protection Force visit at www.indianrailways.gov.in latest news, notifications, admit card, results. UPSC CDS Notification 2018 Latest Jobs Openings for 414 Combined Defence Service Vacancies filled with criteria of written Exam date held in date of 18 November. 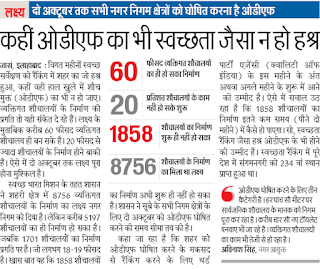 UPSC CDS More detaisl must offline check throgh upsconline.nic.in. All these wings ( IAF Navy Military ) have uploded unfilled vacancies. Selfie for Green UP:- UP Government has launched an Green UP Scheme which names to Selfie with Green UP Yojana. Under the Leadership of Chief Minister Aditya Nath yogi who started Selfie4greenup started before 15 August Independence Day of India. To make environment fresh with fresh bottle of oxygen government wants all citizen of Uttar Pradesh to take part in CM Green UP Scheme. MPPSC Veterinary Assistant Surgeon Recruitment 2018 checks mppsc.demo.in latest Hindi news MPPSC Veterinary Asst Surgeon Recruitment 2018 Backlog Ex-Serviceman Promotion Vacancies in animal husbandry department pashupalan vibhag MPPSC Lok Sewa Ayog Recruitment 2018. 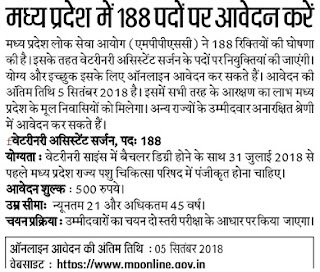 Madhya Pradesh Public Service Commission in Hindi called as MP Lok sewa ayog 188 Veterinary Assistant Surgeon has issued a Backlog Vacancies notification Ex-Serviceman/ Promotion Vacancies on 6 Aug 2018 with Advertisement No: 08/Exam/2018. UP ODF Village List 2018 Applicants can check Latest News of UP Gram Panchayat Toilet List, Swachh Bharat Mission Gramin Level track the SBM Status 2016-17 through Name List and verification number. 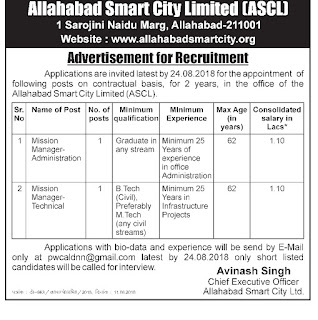 Allahabad Smart City Recruitment 2018 Application are invited latest by 24 August 2018 for the appointment of following posts on contractual basis, for two years in the office of the Smart City Allahabad (ASCL).Application with Biodata and experience certificate will be send by email only at pwcaldnn@gmail.com before the closing date 24.08.2018. Only Shortlisted candidates will be called for interview.